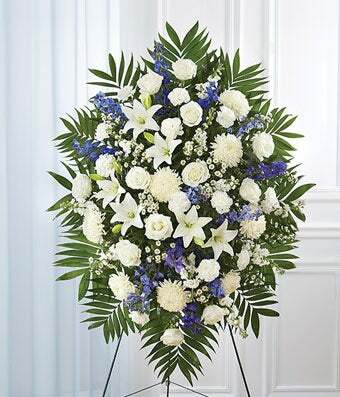 Arranged with blue and white flowers are a comforting symbol of your heartfelt compassion and support. The blue and white standing spray is created with flowers including blue delphinium, white roses, white lilies and more. Medium (shown) measures approximately 46"H x 38"L.